Newtown is a vibrant village filled with eclectic and eccentric people. From the corners of Marrickville to the bustling streets of Enmore, there are plenty of cultured hotspots to grab a bite to eat at. Here’s our list of the current trending eateries around in Newtown. In 2010, a former Newtown Observatory turned restaurant and bar opened at the end of King Street. Illuminated with industrial lighting, Bloodwood greets guests with its rustic interiors and serves artfully plated dishes infused with unique flavours matched with their funky cocktails. Bloodwood Restaurant also hybrids as a bar area/ waiting area, a mezzanine dining area, back deck dining area and a communal table in the basement gallery. 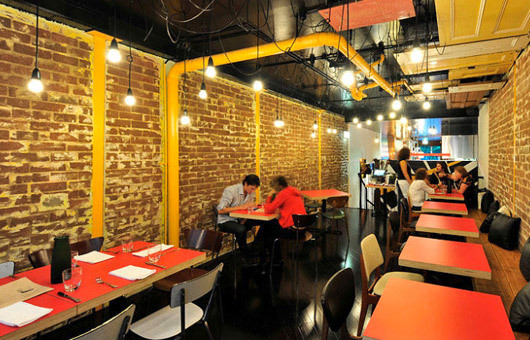 Fine Dining finds an unusual spot in Newtown. Across the road from Black Star Pastry, you will find nestled off the main street of Newtown, a delightful restaurant with an irresistible degustation menu designed by former Marque chef, Karl Firla. Be inspired by his dishes and experience the decadence of Oscillate Wildly’s innovative creations. Transport yourself to the Southern parts of America when you enter Miss Peaches, a jazz and blues-filled diner.Mimicking the exteriors of a Southern American shak, this soul food kitchen will give you a menu filled with Southern Fried Chicken, gumbo, pie, jambalaya and sliders. Have you ever thought about eating at a restaurant decorated with yellow rubber duckies? Me neither. But Newtown Hotel greets you with an abundance of yellowy friends suspended above the bar. The Animal is located upstairs, and true to its named, the menu serves animals, a line-up that does not cater very well to vegans or vegetarians. If you enjoy your meat cooked on coal-fire BBQ pits, The Animal is definitely the place for you. On the opposite end of the dietary requirement spectrum comes “Lentil As Anything”, a vegetarian restaurant that originally began in Melbourne, caters to those who enjoy organic, cruelty-free meals. Opened in 2015, the place also serves mocktails with a great upstairs hangout area. Staffed by volunteers and paid refugees, Lentil As Anything offers a community friendly experience.